Edition Elm founder and manager Mr. Ivaylo Hristov plays trombone with Sofia Philharmonic Orchestra, New Symphony Orchestra Sofia, Classic FM Radio Orchestra and Bulgarian Symphony Orchestra – SIF 309 in Sofia. 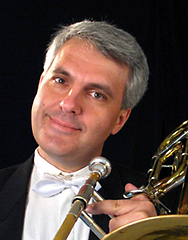 He studied both conducting and trombone in the Music Academy in Sofia during 1980s. Founder of Sofia Philharmonic Trombones quartet in 1987, and AKWI trombone quartet in 1996, he also performs with Sofia brass quintet and other diverse groups. For these ensembles he has made many transcriptions and arrangements, choosing known music out of the works of Johann Sebastian Bach, Wolfgang Amadeus Mozart, Franz Schubert, Robert Schumann, Johannes Brahms, Claude Debussy, Edvard Grieg, Maurice Ravel, Scott Joplin, Isaac Albèniz, Paul Dukas, Carl Maria von Weber, Giacomo Puccini, George Gershwin, Antônio Carlos Jobim among others, that do not exist otherwise in brass player's repertoire. Arrangements for trombone ensembles by Ivaylo Hristov are also published in the USA by Kagarice Brass Editions.